Here at Madley Plants we don't specialise in any particular type of plants, we try to have as broad a range on offer as possible. That includes ornamental and fruit trees, perennials, shrubs, roses, climbers and seasonal bedding. We are regularly adding new stock from a number of suppliers but if there's anything in particular that you want and we haven't got, we'd be more than happy to try to source it for you. We also stock Humax multi-purpose and ericaceous compost and Melcourt 'RHS Endorsed' peat-free multi-purpose compost too. Our shop is now open and you can find all the details about it here. The cafe is open everyday for great tea, coffee, home made cakes and locally produced ice cream. Our cakes are made by a lady in Madley and the ice cream comes from the team at Rowlestone Court, about 25 minutes away. We have plenty of seating inside and on nicer days outside too, so come over for a mooch and treat yourself. The cafe closes half an hour before the nursery does (opening hours are listed below or on the homepage). We love to welcome dogs at Madley Plants and we have our own black lab, Manny. He barks occasionally at a cyclist or van that arrives but it's just for show and he's a real softy. He wanders around the nursery off his lead so as long as your dog is OK with that and has a lead, then your pooch is more than welcome! We've just started to stock these guys' pure hardwood charcoal too - in both 3 and 6kg bags. Birchwood Forestry create sustainable pure hardwood charcoal from SSSI (Site of Special Scientific Interest) woodland, made with love and passion in the heart of Herefordshire. Their charcoal is not only chemical free but won't taint food and is very easy to light. We're pleased to be retailers of Certainly Wood's fantastic kiln dried logs, kindling and flamers, their natural firelighters. All products are equally good for fires in the winter as they are for BBQs, fire pits and outside ovens in the warmer months. 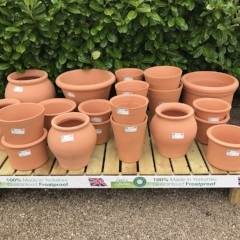 Now in from Yorkshire Flowerpots we have a great range of pots. Guaranteed for life against frost, these are available in a variety of different shapes and sizes. We also have a range of frost resistant pots too. These are available for spending here at Madley Plants and come in £10, £15, £20 and £25 values. We occasionally send out a newsletter so if you’d like to signup, you can do so here. We promise we won’t fill your inbox with loads of emails and we will never share your details with anyone else. We accept cash or debit and credit cards (not Amex) but unfortunately we don't take cheques or £50 notes. For those with the ability to keep any frost at bay with a greenhouse, polytunnel or similar, our first stock of vegetables are in! We currently have a great mix of tomatoes, runner & french beans, leaks, cabbage, lettuce, cucumber, beetroot, asparagus, cauliflower and sprouts as well as some early, mid and late fruiting strawberries and a good selection of kitchen herbs.